If we have bananas that are getting a little too ripe, and we know we won’t be able to eat them before it is too late, we freeze them! Peel them, put them in a bag and throw them into the freezer. You can take a couple of bananas out of the freezer in the evening and they are ready to be mixed into a breakfast smoothie. They will get soggy when thawed again, but that is no big deal when we are going to blend them anyway. You can also turn them into delicious (and very low fat) ice cream. I use 2-3 bananas per person. Take them out 30 minutes before you begin to prepare your ice cream so they can thaw just a bit. That way there is less of a chance that you ruin your blender. When the bananas begin to feel a little soft (but still very cold), you can blend them. You don’t need to add anything else, the bananas are yummy on their own, but you CAN add a bit of peanut butter, or some honey, or even chocolate or chopped nuts if you have either available. Scoop ice cream into bowls, decorate if you feel like it.. We got the chocolate sauce for free with a coupon in December. Serve immediately. I have yet to experiment with making a bigger batch to keep in the freezer, but I tend to think that it will be too hard to scoop out when completely frozen. So I only make as much as I need. I’m glad I’m not the only one that makes their bananas into ice cream! 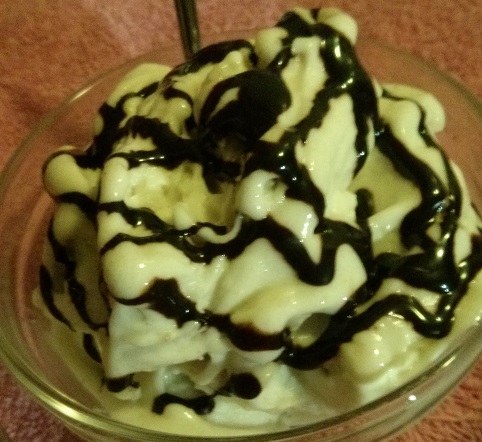 I actually posted a recipe for coffee ice cream made with bananas, if you’re ever in the mood to shake your ice cream up a bit I’d love for you to check it out! Have a great day! That sounds delicious too! I’ve always added cold coffee, a bit of chocolate powder and – get this – oatmeal, to my vanilla ice cream. It is very good!